Rhododendron ‘Nova Zembla’ is one of the older varieties of rhododendron available on the market. This particular hybrid, cultivated in 1902 in the Netherlands, sets itself apart with showy trusses of dark red, funnel-shaped flowers with a brown mark in the centre. The red flowers fade to deep pink if they are exposed to strong sun. Other than that rhododendron ‘Nova Zembla’ is tolerant of extremes of temperatures, especially sun and heat, although it favours a spot in dappled or partial shade (deep shade is best avoided). Similar to most rhododendrons it is an evergreen that thrives in cooler climates, but it doesn’t cope well with harsh winters. Rhododendron ‘Nova Zembla’ is a relatively vigorous grower and will grow approximately 20cm per year, reaching an ultimate height of around 1.5-2m. 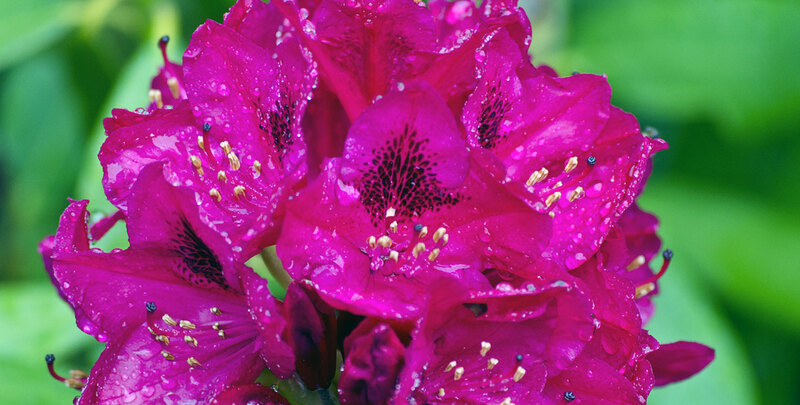 This variety is one of the earliest flowering rhododendrons, as the flowers may appear as early as mid April. The striking blooms have a backdrop of dark green foliage that adds considerable ornamental value year round. Rhododendron ‘Nova Zembla’ has a conveniently dense growth habit, which makes it suitable for privacy hedges. It can handle most garden situations, but where necessary the soil should be made sufficiently acidic by adding ericaceous compost. Plant shallowly in moist, well-drained soil rich in humus. No pruning is required.